1 Typically, which network device would be used to perform NAT for a corporate environment? 2 What is the group of public IPv4 addresses used on a NAT-enabled router known as? 3 When NAT is employed in a small office, which address type is typically used for hosts on the local LAN? 4 Which version of NAT allows many hosts inside a private network to simultaneously use a single inside global address for connecting to the Internet? 5 Which type of NAT maps a single inside local address to a single inside global address? 6 Several key servers in an organization must be directly accessible from the Internet. What addressing policy should be implemented for these servers? Use dynamic NAT to provide addresses for the servers. Place all of the servers in their own Class C private subnet. 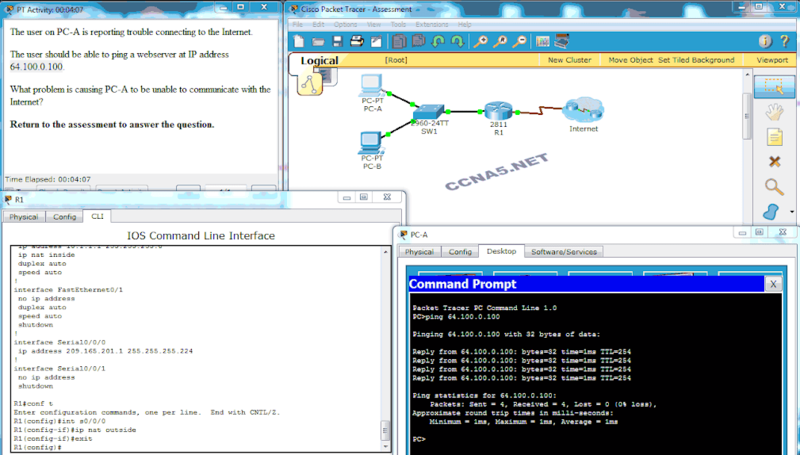 Use DHCP to assign addresses from the pool of Class B addresses. 7 What is a disadvantage of NAT? Refer to the exhibit. What has to be done in order to complete the static NAT configuration on R1? R1 should be configured with the command ip nat inside source static 209.165.200.1 192.168.11.11. R1 should be configured with the command ip nat inside source static 209.165.200.200 192.168.11.11. Interface S0/0/0 should be configured with the command ip nat outside. 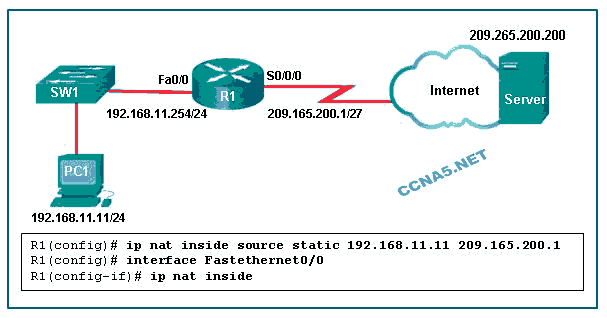 Interface Fa0/0 should be configured with the command no ip nat inside. 10 Which statement accurately describes dynamic NAT? 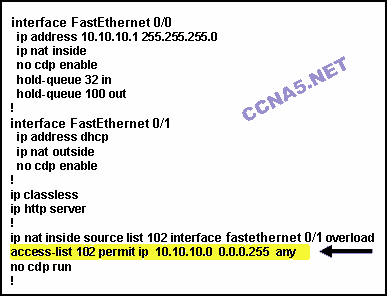 11 A network administrator configures the border router with the command R1(config)# ip nat inside source list 4 pool corp. What is required to be configured in order for this particular command to be functional? 12 When dynamic NAT without overloading is being used, what happens if seven users attempt to access a public server on the Internet when only six addresses are available in the NAT pool? 13 A network engineer has configured a router with the command ip nat inside source list 4 pool corp overload. Why did the engineer use the overload option? Refer to the exhibit. What will be the effect of entering the command that is shown in the exhibit on R2 as part of the dynamic NAT configuration? It will define a pool of addresses for translation. It will identify an inside NAT interface. It will bind NAT-POOL1 with ACL 1. It will define the source ACL for the external interface. 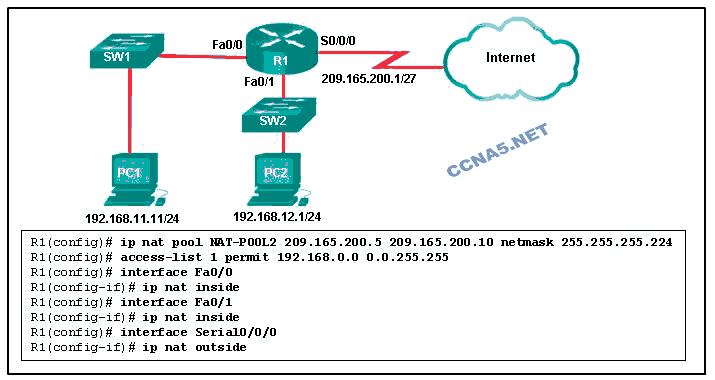 15 Which configuration would be appropriate for a small business that has the public IP address of 209.165.200.225/30 assigned to the external interface on the router that connects to the Internet? Define a standard access list denying the addresses that should be translated. Define the range of ports to be used. Define a standard access list that allow the outside global addresses to be used. 18 What is the purpose of port forwarding? 19 What is a characteristic of unique local addresses? R1 replaces the address 192.168.10.10 with a translated inside global address. R1 checks the NAT configuration to determine if this packet should be translated. R1 selects an available global address from the dynamic address pool. The host sends packets that request a connection to the server at the address 209.165.200.254. If there is no translation entry for this IP address, R1 determines that the source address 192.168.10.10 must be translated. 25. How does NAT complicate the use of IPsec? 26. Which technology would be used on a router that is running both IPv4 and IPv6? 27. Which prefix is used for IPv6 ULAs? 28. Fill in the blank. Do not use abbreviations.